Rising dovetails. This is another sample of a joint that has vexed me for over a year. Originally I did the single version larger in two pieces of cherry to tie together the top of an A-framed cabinet side leg. The problem then was that although the visible end was tight, the back side was loose. This solution came to me as I was staring at two small blocks of walnut that I wanted to join at a shallow angle. The secret I had missed originally is that when a dovetail ramps into the edge of a board the surface entry width is the same as the widest part of the bit. The other end of this cut the surface width matches the width of the dovetail bit at that depth. It meant the mating outside cuts had to be tapered... wide for the shallow end of the pin and narrow at the deep end. The 4-wide sample completely apart. Both samples were cut on my Meteor, clamped to my angle clamping jig that mounts on the front rail. 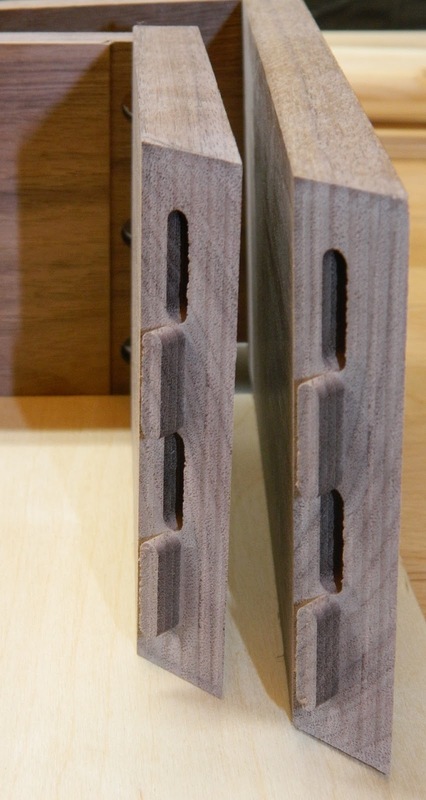 Internal Mortise & Tenon for mitered box corners. The boards were mounted at 45 degrees on my angle jig. The same toolpath file was cut on each side. Invisible when assembled. Clamping when gluing up is easy. Thanks Hannah. After helping several students cutting mitered corner joints for a box project I woke up the following day thinking it was a shame to have essentially thrown away the mitered waste to leave a weak joint. This joint still cuts away exactly the same amount of the 45 degree end but leaves tenons with mortises to stick into to make gluing the joint together far simpler and stronger than usual.